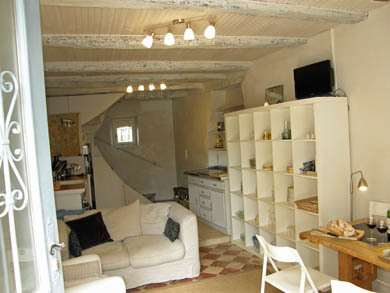 Maison Felix is a well equipped cottage on four levels, with a comfortable kitchen and living area at ground level, a peaceful double bedroom with WC & bathroom on the first floor, a delightful salon with a breathtaking view of Cordes sur Ciel on the second floor (with a sofa bed) with separate shower and WC, and a spacious attic with double bed, and glorious views from the skylight. 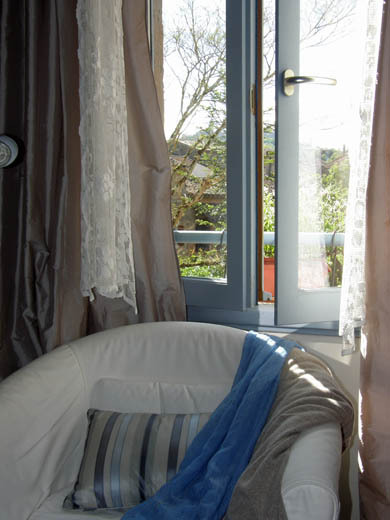 Just around the back is a garden with a sheltered area, a hammock a table and chairs for al fresco dining. 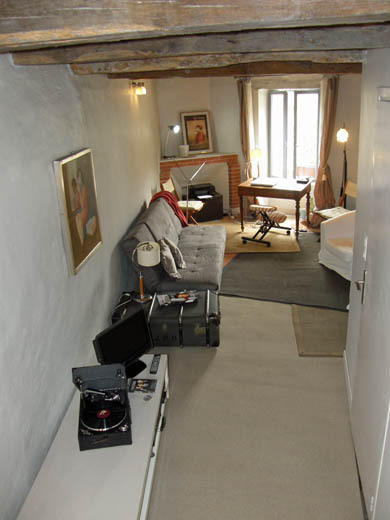 Maison Felix can be rented for your holiday. 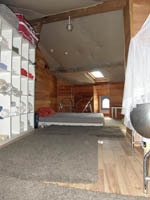 The house is beautifully furnished with a feeling of light and peace throughout. 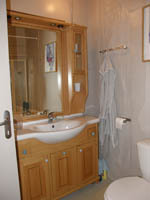 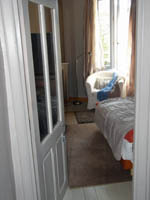 There is modern electric heating, a log burner and double glazing. 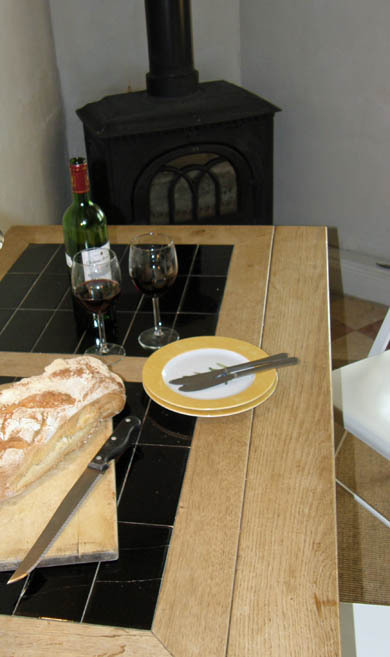 The kitchen and comfortable room on the ground floor of Maison Felix, has a log burner for cooler autumn and winter evenings. 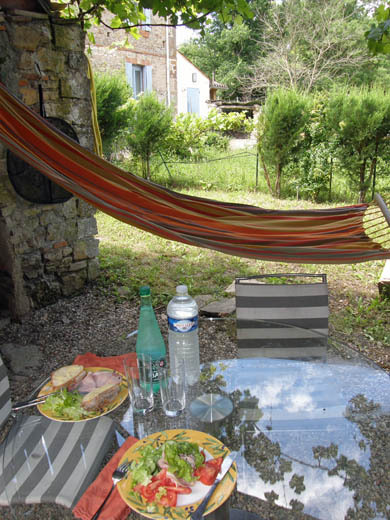 Just around the back is the garden, with a tiled roof over the patio for summer shade, and a hammock for a lazy afternoon with a good book. 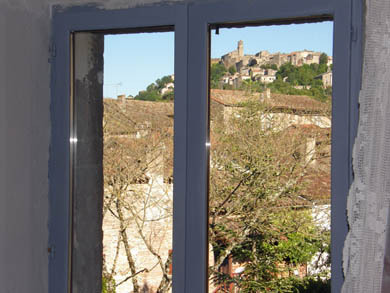 The picture on the left shows the fabulous view of Cordes from the salon on the second floor. 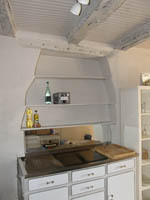 The kitchen of Maison Felix is equipped with an induction hob, an electric oven, a washing machine, a coffee machine, a pretty Limoges dinner service, and ample pans, cutlery, and sundry equipment. 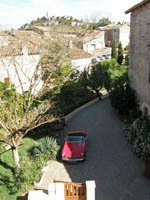 There are a plethora of walks directly from Maison Felix, into the countryside, along the river banks, or up into the magnificent fortified medieval town of Cordes sur Ciel. 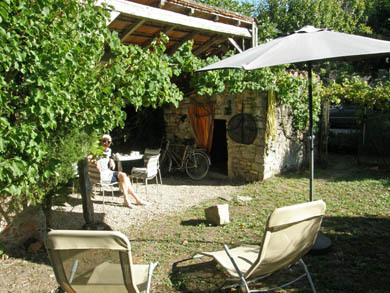 You can use the bicycles to travel further afield, or to visit the Garrisou water park on the outskirts of the village. 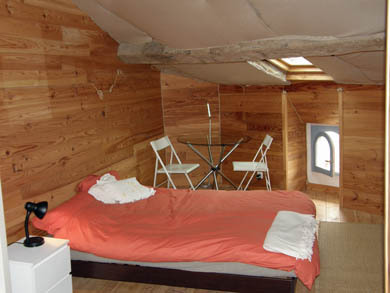 There are weekly markets in Les Cabannes and Cordes.